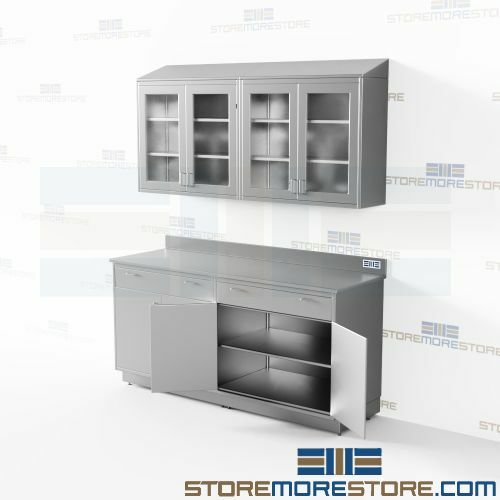 These stainless steel cabinet kits come in a variety of configurations to suit your needs. Choose from base and upper cabinets with doors, drawers, sloped tops, backsplashes, and more. Kits with upper cabinets have tempered glass doors. Their durable stainless steel construction makes them ideal for storing and working with food, chemicals, electronics, medical devices, parts, and more. 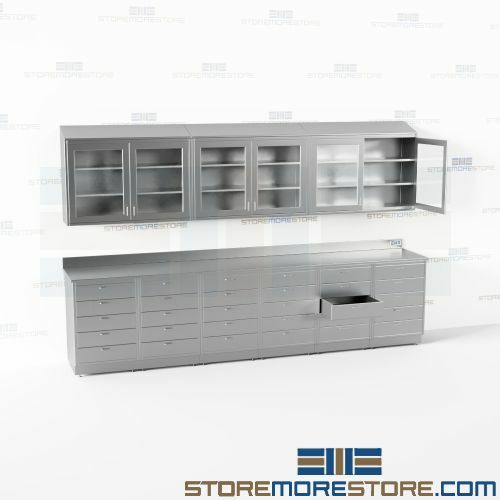 Stainless steel base cabinets are available with doors, drawers, open configurations or a combination. They resist rust and corrosion and are easy to clean for use in sanitary environments. Cabinet tops ship in one piece up to 12′. If this size is too large to maneuver through your facility, please contact us for custom sizing options. See below for additional features. Stainless steel cabinet kits are available to buy online and ship within 8-9 weeks with free dock-to-dock shipping included. If you need any assistance or just want some help picking the right solution for you, please call us at 1-855-786-7667.